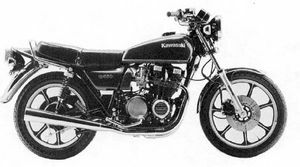 The Kawasaki KZ650-F1 was a cross between a C and a B model. It featured Alloy wheels; a drum rear brake instead of disc brakes. Remarks: Minor modification of KZ650B. Front single disc and rear drum brakes, cast wheels, automatic cam chain tensioner. The F1 was basically a cross between a C and a B model. It had the alloy wheels but kept the drum brake at the rear instead of a disk. It was offered in three colours, blue, red or green. Major Changes: Color & graphic, front dual disc brakes, transistorized ignition system. Kickstarter is discontinued. This year model featured many major changes, using parts from the new KZ750. Electronic ignition, black motor, new clocks, and no kickstart. This was the last year of the F model in the US. The F2 was much modified over the F1 model. It incorporated many of the larger Z750E parts. The motor was now finished in black and used CDI ignition instead of points. The front end from the 750E was grafted on meaning a change to the brakes, front wheel and clocks. It was offered in three colours, red, green or blue. 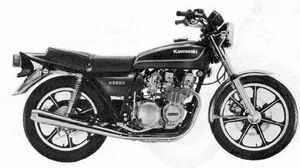 The kick-starter pedal and shaft was removed from the engine just like the Z750E. A passenger grab rail was also fitted. Featured new carbs and airbox from the KZ750E/L models. There was one major change for 1982, CV carbs were fitted. The larger 32mm carbs also needed the air box assembly from the Z750E/L models. The F3 was offered in two colours, ebony or passion red. The front fender was now also painted to match the rest of the bodywork. Starting Frame Number: KZ650F-014301 This was the last of the 650 models, Kawasaki was now concentrating on the GPZ range and there was no place for this previous best seller. The F4 was offered in two colours, galaxy silver or candy wine red. The outer engine cases were similar to the Z750L model. There was also a Z650H model, not available in the UK. This was a 'CSR' model with chopper styling. This page was last edited on 21 January 2011, at 00:24.